Spray a 5- to 6-quart oval slow cooker with cooking spray. In large bowl, beat cake mix, water, eggs, 1/2 cup peanut butter and the butter with electric mixer on low 30 speed seconds, then on medium speed 2 minutes, scraping bowl. Remove 2/3 cup of the batter to medium bowl; stir in 1/2 cup chocolate syrup to make chocolate fudge batter. Spoon 1/2 of the peanut butter batter into the slow cooker, followed by all of the chocolate fudge batter. 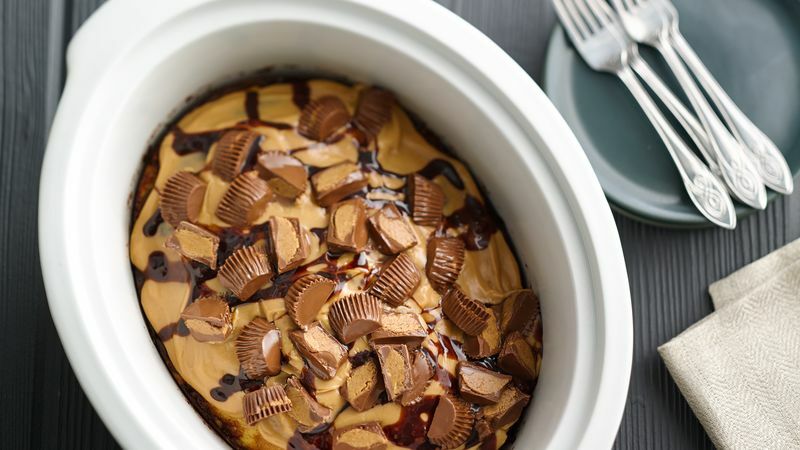 Top with remaining peanut butter batter. Swirl with a knife in a circular motion. Cover; cook on High heat setting 1 hour 45 minutes to 2 hours 15 minutes or until toothpick inserted in center of loaf comes out clean. Turn off slow cooker; uncover, and remove ceramic base from cooker to cooling rack. Let cool 15 minutes. In medium bowl, beat 3 tablespoons peanut butter and 2 tablespoons milk with whisk until smooth. Add powdered sugar; mix until smooth. If necessary, gradually add additional 1 tablespoon milk until glaze is desired consistency. Spread peanut butter glaze over cake; drizzle with the chocolate syrup. Sprinkle peanut butter cups over top of cake.